It seems to me that not enough time, effort, blog posts, etc. has been dedicated to the humble walking foot. It is as though the walking foot is the “ugly duckling” of the quilting world. It is often overlooked for it’s more well known cousin the “free motion” foot, quilting foot, hopping foot or darning foot (whatever you want to call it.) Probably because we are all in awe of the beautiful results that can be achieved at the hands of a master long arm quilter. 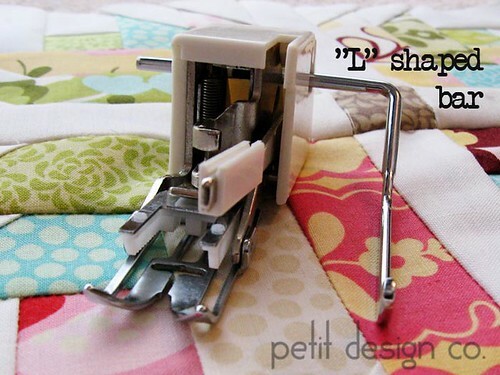 A lot of quilters I know seem to think that the only thing you can do with a walking foot is to SID (stitch in the ditch,) and that truly amazing quilting can only be achieved through free motion or computerized quilting. I’m going to prove them wrong by giving you lots of ideas on how to use your walking foot on a REGULAR domestic sewing machine to quilt your own quilts. What is a walking foot?A walking foot can look rather big, clunky and complicated. The only thing complicated about it is putting it on your machine and once you figure it out, it’s really not that hard. 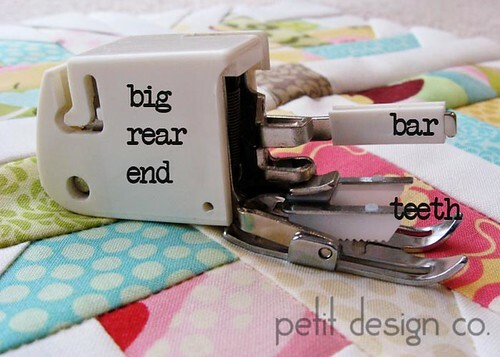 A walking differs to a regular sewing machine foot by having an additional set of teeth, a bar and a big rear end. Sometimes a walking foot will come with a removable metal “L” shaped bar. If you have a choice between a walking foot with a bar and one without, purchase the one with the metal bar. A walking foot can range in price from $18-$40 depending on the brand of your machine. Why a walking foot?A walking foot is awesome for quilting and everyone should own one! 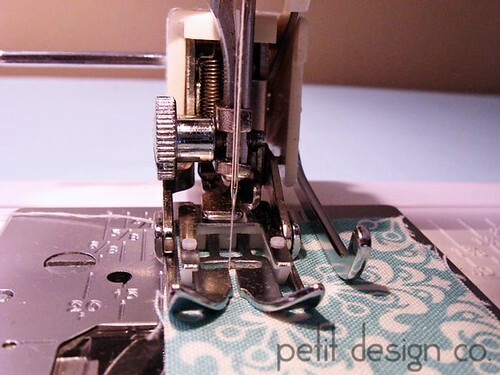 The extra teeth work in sync with the teeth (feed dogs) of your sewing machine. They help to grip things better and feeds thick materials more easily through the machine. It also helps the quilt layers feed evenly through your machine because it is actually feeding the top layer as well as the bottom layer. A walking foot won’t get you out of basting but it will be a huge help in minimizing puckers. Sadly, a walking foot will not solve your issues about having a machine with a small throat. However, when I first started quilting I found that quilting with a walking foot was easier than free motion because the machine was moving all the layers for me. It was easier for me to focus on just one thing instead of all the various steps that go into free motion. Attaching the walking foot:The biggest mistake when using the walking foot is not attaching it properly. The key is to make sure that the bar of the walking foot is over the needle bar. In this picture you can see that the bar is not over the needle bar. If the walking foot is attached this way then the “teeth” of the walking foot will not engage. The purpose of the bar on the walking foot is to “ride” the needle bar. When attached properly the bar controls the walking foot “teeth. Every time the needle goes down the “teeth” come up and vice versa. 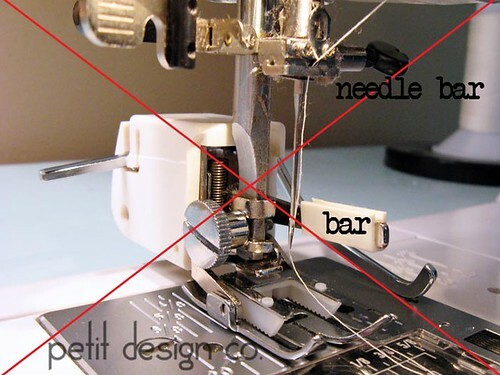 The “L” bar:The “L” bar is just a guide to help you quilt without having to mark your quilt tops! 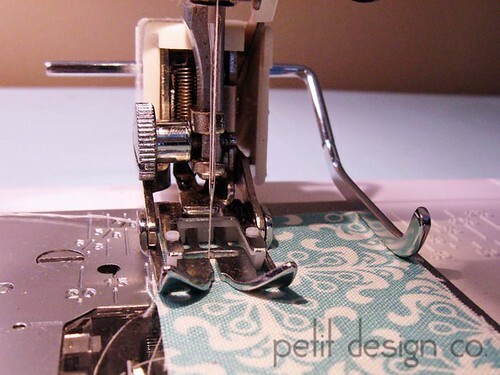 Think of it as the edge of your sewing machine foot, except it’s repositionable! You can set it narrow by pushing it in towards the walking foot. Or you can set it wide by pushing it away from the walking foot. The “L” bar along with needle position will give you lots of options for spacing quilting lines without marking the quilt! Oh yeah, I’m all about not marking! Excellent first post. I will say that Bernina walking feet are $100+; thankfully I have a coupon. Your photos were excellent and I'm excited to see more! Thank you for taking the time to post this month! I wish they made them with the bar on the other side. With the bar on the inside, you end up with the bulk of your quilt on the inside and it's so much harder to quilt that way. I will be watching for more posts on this. I have never successfully quilted with a walking foot, but I have one! I have looked around your blog and was very interested in your 31 days with the Walkingfoot. I will be following you on this adventure, since I wouldl like to quilt with my walking foot and not need to send every quilt top I have out for quilting and I am tired of stiching-n-the-ditch. I will be following your "31 days of quilting with a walking foot". I have a walking foot on my sewing machine and I think it would be a great way to quilt many of my quilt tops. I'm a new follower. I found you on the blog hop this morning and this topic sounded too good to miss. My walking foot is on my machine correctly and I think I own L bars for either side, I need to clean out a drawer to see if I'm not dreaming that up. I use my walking foot all the time for stitch in the ditch quilting. I'm excited to learn other techniques & skills! Thanks for taking the time to teach me! Exelent post, I have a walking foot that came with mt Confidence Quilter from SInger. I use it all the time. I will be following along in this 31 days schedule to get the most out of my walking foot. Thanks! I am here from the Sew Many Ways blog linky party post. I love to quilt with my walking foot and am excited to get some tips on new things to try. Thanks so much! Hi,I also found you through the Sew Many Ways linky! I am very interested in your topic . Although I have quilted with my walking foot,it has only been a few times. It will be awesome to learn new designs and techniques :) Will be following along for sure! I also use my walking foot for sewing on binding. Looking forward to your posts. I have a very old Pfaff (varimatic 6091) that came with built in dual feed. I had assumed that this was just another name for a walking foot but I just wanted to know for sure. Thank you for your website - I only just learned about it but it is great. I recently purchased a Janome 8900 which I just love! I use the walking foot, called the acufeed, for most of my piecing now. I have it set for a perfect 1/4" seam and it easily sews over lumpy places where lots of seams come together without slipping over a bit to the side. This machine does come with a 1/4" piecing foot and I also bought another piecing foot with guides but the walking foot is still the best and the one I use the most. Is anyone else using a walking foot for piecing I wonder? Just found your post through pinterest. Never knew about the bar. Learned so much in the first post, now I just have to read the rest. Thank you! I just started using a walking foot for my brother ce-5000prw. My question is I heard not to do a back stitch but my seams are unraveling. Can I back stitch or not? Or what stitch length is best to use. Also, the link to your email address is not working. I can't find your name anywhere on your site. I just found you through Pinterest and I'm so glad I did! I've been so afraid to try quilting on my Janome but with your excellent tutorial I believe I can now do it without ruining the quilt top. Thank you so much for sharing your knowledge with us. I, likewise, found your "31 Day Walking Foot Series" on Pinterest, and have already shared it with a couple of friends who are just starting out in quilting. I love your Day 1 Post, your explanation of the Walking Foot and Bar & am very excited about going through the 31 Days Series. I have used my Walking Foot for attaching bindings, and to quilt parallel lines, (marking the quilt top! ), but have never used the Bar that came with it. That is about to change! Thanks for taking the time to do such a great detailed series. I would love to have you as a live, in person, teacher. I imagine your students gain tremendous knowledge with the time they have with you. How do you secure the L-shaped guide? The one time I tried it slipped and moved and obviously that does not bode well for accuracy.